Fonny, Fonny (2005) Hubungan Resiliensi Dan Prestasi Akademik Pada Anak Tuna Runggu. Studi Pada Anak Di Masa Pertengahan. Skripsi thesis, Universitas Tarumanagara. Resilience is human capacity to face, overcome and be strengthened by the adversities of live. The aim of this research is to see whether the children who have resiliency can overcome their adversities, especially their adversities of language and communication which is affecting their academic's achievement. Subjects are 31 of middle childhood children. 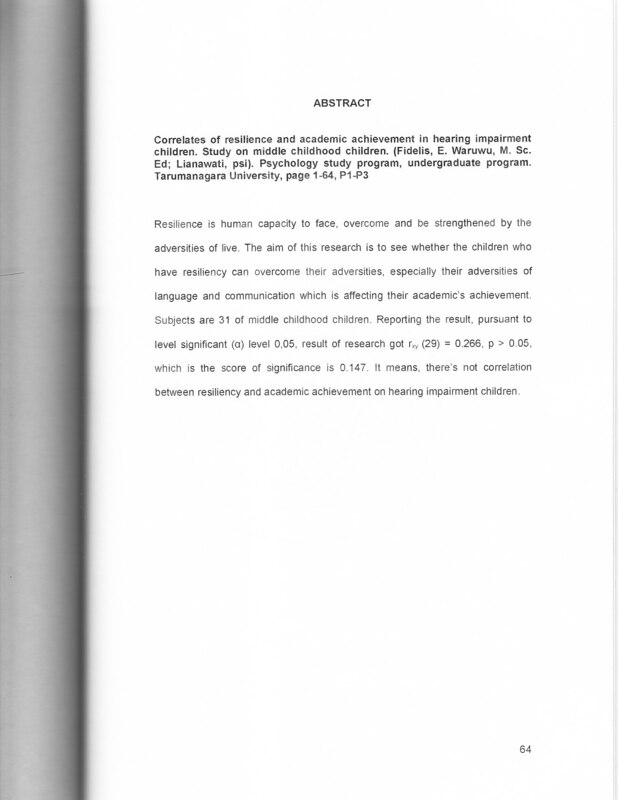 Reporting the result, pursuant to level significant (a) level 0,05, result of research got rxy (29) = 0.266 , p > 0.05, which is the score of significance is 0.147. It means, there 's not correlation between resiliency and academic achievement on hearing impairment children.